With a large clear display, the Lathem 7500E electronic time clock provides precise and exact time information using a signal from the WWVB atomic clock in Fort Collins, Colorado. 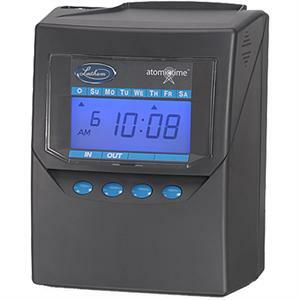 An atomic time clock that automatically calculates worked time between punches and accumulates totals on the card for up to 100 active employees or jobs. The 7500E lets you set pay periods or set job modes for accurate costing information. You can choose to automatically calculate actual or rounded time, and setthe time clock to support automatic break deductions from daily totals. The internal lithium battery maintains the time, card totals, and program settings for up to 3 years without power. Optional rechargeable battery keeps unit fulloy operational for up to 24 hours in case of a power failure. Calculates actual or rounded time. Print 12-hour (AM/PM) or 24-hour, with regular minutes or hundreths of hour. Prints day of week or date. Ability to transfer card totals to another card. Prints English, Spanish or French. Wall or desk top mounting. Built-in lithium backup battery for 3 years of data protection time during power outages. Optional Ni-MH battery backup to provide full operation during power outages. Requires E7 bar coded time cards sold separately. Dimensions: 8" x 6.125" x 5"